The ROMA Hotel is a 4 star first class boutique hotel in the historical centre of Prague well known for its friendly service and excellent Value for Money. Uniquely located next to the legendary Infant Jesus of Prague. In the neighbourhood of the Charles Bridge Prague Castle and Czech Parliament. In walking distance to the Old Town Square. Surrounded by romantic Gardens panorama View Points original Galleries many delicious Restaurants and cosy Bars with life Music. 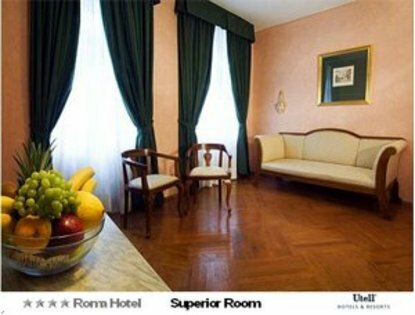 The newly rennovated house of ROMA with rich history since 1678 offers 87 air-conditioned Rooms with tasteful Italian furnishing. The charming Superior rooms are equipped with original antique furniture romantic garden view tea and coffe maker. The spaceous Apartments with a kitchenette are ideal for an extended stay friends and families. Children till 12 years stay free of charge. Business Travelers benefit from free WiFi internet safe garage parking business centre and a meeting room. All guests can relax in the fitness room and sauna or enjoy a traditional Thai Massage in the new Spa area. The hotel offers yearround promotions for 2 3 4 nights or midweek. The longer you stay the less you pay per night. Stay 4 nights for a price of 3 at corporate rate.Or book minimum 21 days prior to arrival and save at least 10 Percent of Best Available Rate. The Best Available Rate guarantees best Rates in Parity on GDS and Internet.